Do you know of agencies that will sell my property and what is the standard commission for sponsorship sales? We get this question at least two or three times a week so we recently put it to a SponsorPitch member poll. With 295 precincts reporting, 10-20% commissions look to be the standard protocol. Disclaimer: this can vary significantly depending on the agency's experience, deal size, retainers and such, but 15% seems to be the starting point for most. What tips do you have on working with and motivating sponsorship sales agencies? Retainer or no retainer; all commission, no commission or something in between? If you're an agency, what parameters do you have for taking on a new client? Share some advice with other members in the comment section below -- best comment (as decided by us) between now and 9AM est next Wednesday will get a FREE one month upgrade to a Prospector account. 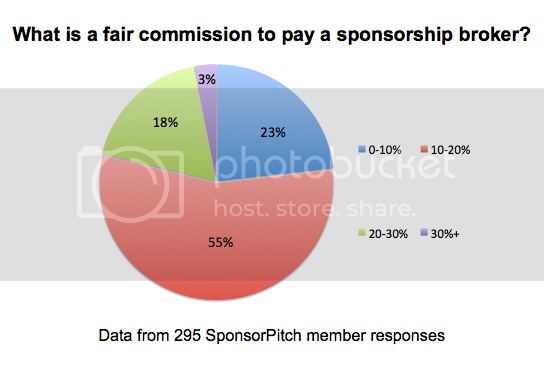 Don't forget to head over to the dashboard and take part in this month's new member poll, which takes on the topic of 2014's fastest growing sponsorship categories.